Needlessly Complex Name Backstory: Named for the greek god of dreams because his mama cat Kali, who was a Bombay, was named for the Hindu goddess, and because he slept more than his litter mates when he was a kitten. Gotcha Method: Born in my front closet. 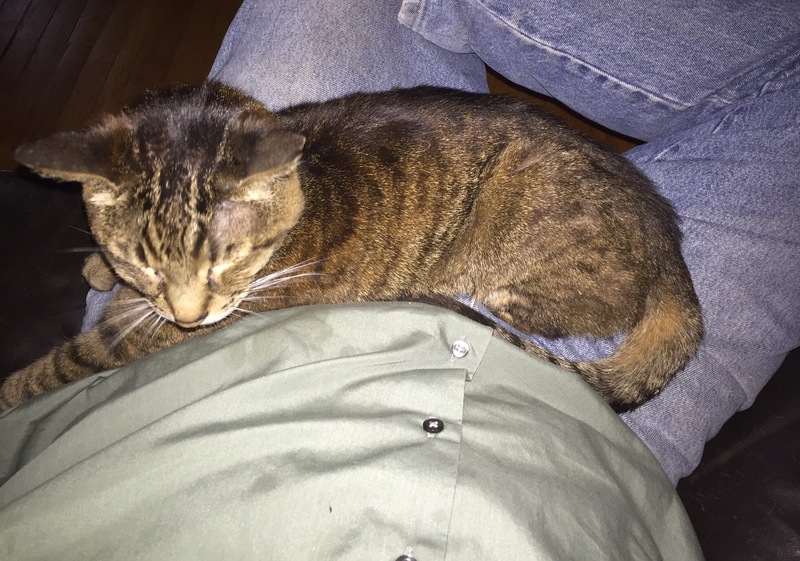 Distinguishing Features: Being brown, being stripy, having three legs, purring for hours on end, moving like a cross between Tiny Tim and an inch worm, being Perch’s actual biological brother. Favorite Activities: Sleeping, Eating, Sleeping in my lap, Sleeping on my chest, placing his cold, chunk of raw liver nose a half a micron from my skin, finding my hand again after I’ve moved it in disgust at the feel of his cold, chunk of raw liver nose hovering half a micron from my skin. Known Issues: Having three legs (which isn’t that much of an issue), being an “outside the box,” thinker, blood curdling, late night yowling for largely undecipherable reasons, the whole liver nose a half micron from my skin thing. Resolved Issues: Cats don’t resolve their issues, they scheme to defeat the solutions to their issues that you’ve come up with. Known Joys: Being curled up by the fire, being curled up in the crook of my arm, purring away, ready to put his liver nose a half micron from my skin.